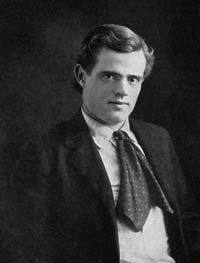 Jack London was an American writer and activist. He was among the first Americans to become rich simply through his fiction, and to become both successful and wealthy from writing stories in magazines. London’s best known books, White Fang and The Call of the Wild, were both set during the gold rush in the Klondike region at the turn of the 20th century. He spent some time living in England, where he wrote an exposé of slum conditions in the city of London. He called himself a socialist, but nevertheless believed in social Darwinism whereby the fittest would survive. London was born John Griffith Chaney in San Francisco in January of 1876. His father was a successful attorney and prominent in astrological circles, but his mother’s unmarried status caused a certain amount of scandal. The young Jack was never close to his father, and his mother married a veteran of the Civil War named John London, whose surname the boy adopted. They moved to Oakland, where Jack lived a fairly hard life as a teenager. Having worked shoveling coal and on a Pacific seal-hunting ship, he eventually found steady work in a cannery. London was a voracious reader from an early age, spending much of his free time in libraries. In 1893, while working on the sealing ship, he had nearly lost his life in a storm. With the encouragement of his mother, the young man – still only 17 – won first prize in a local writing contest with an exciting account of his voyage. London was so taken with this experience that he resolved to make his living as a fiction writer. However, his work was often rejected by publishers, and after an abortive attempt at an academic education at Berkeley, he went to the Yukon to seek his fortune. London did not strike gold as he had hoped, and he was forced to return to California. Although still poor, he felt that the stories he could relate would resonate with the public. His experiences of poverty also caused him to become a self-proclaimed socialist. His first regular publishing job was with stories in the Overland Monthly, where the reality of a world of deadlines and regular publication forced London to put his house in order and become a more disciplined writer. He realized that to succeed, he would have to push himself to write every day, and he set himself a daily minimum of 1,000 words. In 1903, he published The Call of the Wild, the story of a Yukon sled dog, which brought London international fame, although his income from the book was relatively modest. He became a prolific and driven author, producing an average of five books a year during the final decade of his life. The most successful of these was another canine-centric tale, White Fang, in 1906, but he wrote a considerable amount of non-fiction, too. His 1903 book People of the Abyss, a description of London’s time living in the East End of London, was notable for its uncompromising anti-capitalist tone. By the time White Fang appeared, however, London’s health was beginning to fail. He died at the age of 40 in November of 1916, a victim of kidney failure.